Shopping for baby and toddler Christmas gifts can be difficult. In a single toy aisle, you may run through an extensive list of questions, like: Will the child like the gift? Will it entertain them? Will they already have it at home? And the most difficult of all questions: Will the parents be happy with your choice? Ultimately, when we buy a gift for a child, we are also picking a gift that the parents would approve of. So really, you’re picking out a gift for the parents and child. 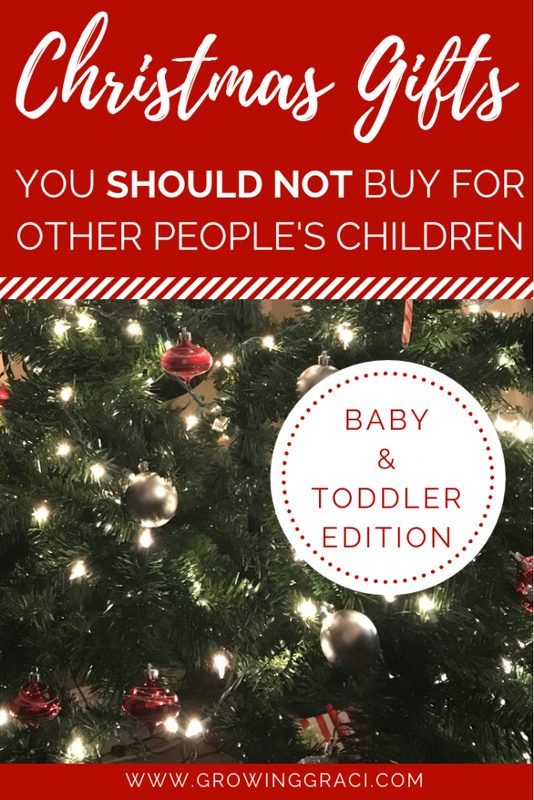 Check out these ground rules to help you when you go shopping for babies and toddlers this holiday season to make sure that what you pick out will be parent-approved! Giving extravagant gifts may seem like an amazingly thoughtful thing to do. And yes, being so generous is amazing! 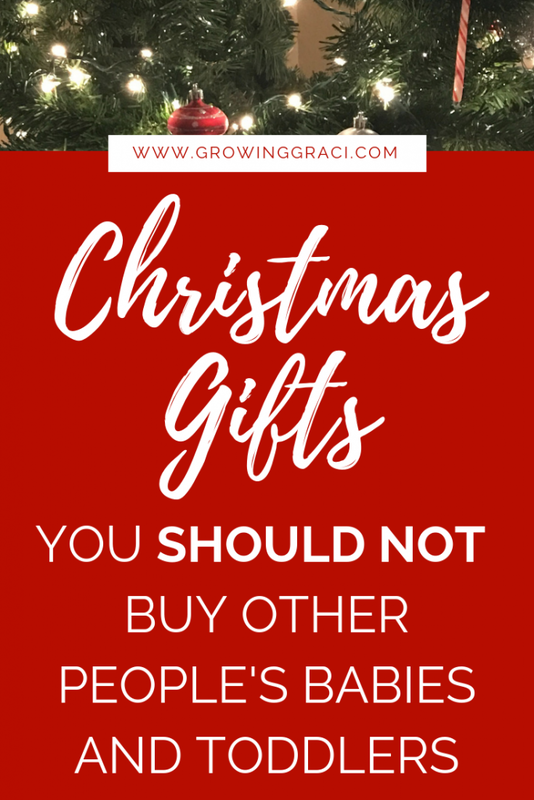 However, it is important that you don’t give extravagant, expensive gifts to other people’s kids without first talking it over with the parents. Without meaning to, you may outshine Santa and/or the parents. Or, the parents may want to limit their child’s interest in material possessions, and your gift may go against what they are trying to enforce at home. Try putting yourself in the parent’s shoes. If someone gave your kid a present that was way over-the-top, how would you feel about it? Unless you’ve already talked it over with the parents, don’t go crazy with your gift giving. If the parents are on board, then by all means go crazy! We’ve all heard the horror stories of Barbie doll houses getting put together on Christmas morning. Don’t do this to other parents! Avoid things with a million pieces, extensive assembly or weird parts that will be difficult to replace. 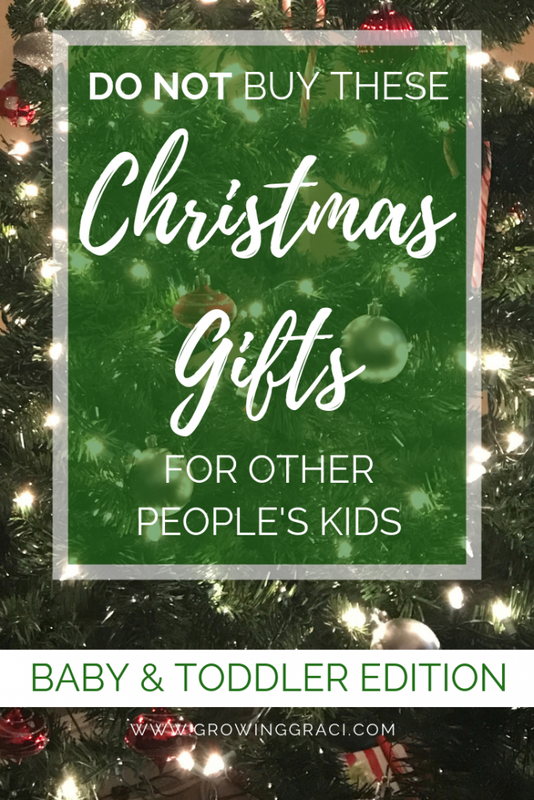 When it comes to gifting for babies and toddlers, this especially comes into play when picking things like puzzles, electronic items, play-sets, etc. If the parents are going to have to track down a billion puzzle pieces every 5 minutes with their toddler, skip it. Instead, choose something that won’t send the parents on a perpetual hunt to find all the pieces! If the present that you’re looking at has a ton of assembly, be sure to ask the parents first if they are up to putting it together, or gift the item already put together. And finally, be sure to check what type of batteries the electronic items take. If they are bizarre batteries that the parents likely won’t have on hand, either buy a large pack of that battery or skip it. The last thing any parent wants is a child crying because their toy doesn’t work. Okay, this one makes me picture the Grinch. Noise, noise, noise. Graci has already been given about a billion noisy toys in her 15 months of life. Most of the time, I’m happy to deal with the noise because they are educational toys, and that’s beyond amazing. And, I know that most toys on the market for babies and toddlers make some sort of noise. So, if you find a gift that otherwise checks all the boxes and you love, but it makes noise, check to see if there is an “off” switch. If so, then you probably won’t end up on the parents’ naughty list. If there is no way to shut the toy off and it goes on for a long period of time, skip it. 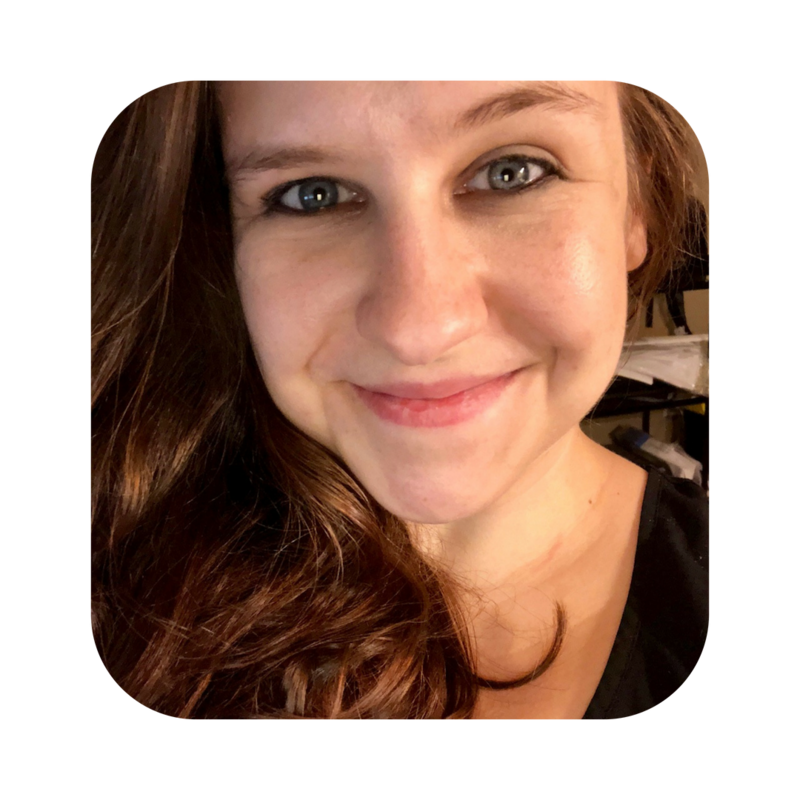 Okay, so it is a ton of fun to buy babies and toddlers large play-sets, play tables, play kitchens, activity centers, etc. However, if you haven’t talked it over with the parents first, don’t show up with a huge gift that is going to take up precious space in the baby or toddlers room or elsewhere in the house. After Graci’s first birthday, we had issues finding homes for all of her new toys. Of course we were so grateful for all of the presents that she received, but it really did create a space issue in our home. Something that so many parents look forward to when they have a child is buying their child their first _______. Parents all have different “firsts” that they want to buy their child. It’s really important to be sensitive to this. Of course, you can’t read anyone’s mind, so it is important to ask the parents about anything that you plan on buying that may be a big deal to the parents. Buying clothes as a gift can be super helpful to parents, especially for babies and toddlers that are growing so rapidly. However, the most important thing about buying clothes for a little ones is knowing what size to buy. If you’re going to buy clothes, the parents are going to be super thankful, trust me. However, it is super important that you ask what size they currently need. And yes, I know that it may seem like an inconvenience to the parents to text them and ask about sizes, but trust me. It is going to be much better in the long run if they are actually able to use the clothes and don’t have to worry about returning or exchanging due to the size. When it comes to picking toys for babies and toddlers, you can usually find an age recommendation on the box. Pay close attention to these when shopping! If shopping for a baby and toddler, don’t pick something for bigger kids. Likewise, if you’re shopping for a toddler, don’t pick an item for an infant. It can be tricky to know what is age-appropriate just by looking at a toy, so definitely rely on those printed age recommendations on the box. And, if you’re not sure how old the baby or toddler is, ask! That’s perfectly okay. A parent shouldn’t be offended that you want to pick out something that will best suit the developmental level of their kiddo. If you’re buying for someone else’s kids, don’t pick something that may not align with the beliefs of the child’s household. There are so many toys and gift items on the market, that you can 100% avoid buying a gift that is going to cause uncomfortable moments. Again, if you really do want to purchase something but you’re not sure if it will be appropriate, ask the parents. They shouldn’t be upset with you as long as you ask before giving the item. Many children have issues with certain types of foods due to dietary restrictions or allergies. You’ve just got to ask on this one first! You wouldn’t want to give a child something that they won’t be allowed to have. This has been a long post of things that you shouldn’t give as Christmas gifts. So what should you give? 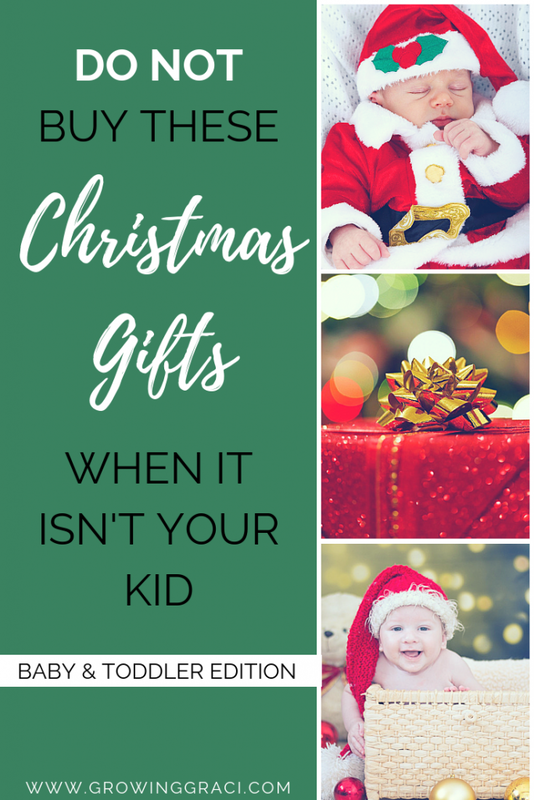 Even if the child is too young to pick out their own gift, the parents can still take the gift card and pick something out that is either needed, or a toy that isn’t something they already have. Look, not everyone has kids. I get that. I would have had no idea what gifts to buy before I had Graci, either. So trust me when I say that parents won’t be offended if you ask them questions about what to buy their little ones. They will appreciate that you care enough to ask!